Celebrity Big Brother spoilers: Who is up for eviction? The first nomination spoilers have been released ahead of tonight’s Celebrity Big Brother. Last night, host Emma Willis revealed that there will be a massive double eviction this Friday in which two unlucky housemates will just miss out on their chance to make it to the final. To determine who will face the axe, the celebrities have been told to take part in face to face nominations. This time there was a twist, however, as the group were made to play a special nominations card game. 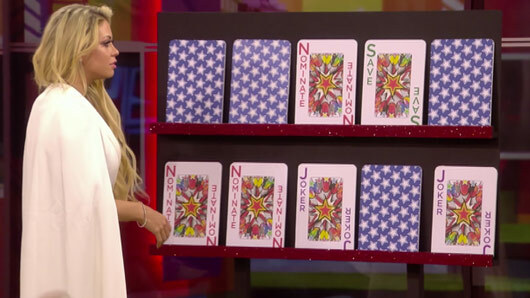 The housemates were to select a card at random stating either ‘Nominate’ or ‘Save’. And to make things more interesting there was also a mysterious ‘Joker’ card thrown into the mix. As we already know, James Cosmo will be safe after receiving eternal immunity, whereas Speidi will definitely face eviction due to their eternal nomination. Bianca and Jessica therefore join Speidi in currently facing Friday’s double eviction, while Coleen and Jamie join James Cosmo in the safety zone. To see who else is up for eviction we will have to watch tonight’s highlights show, in which the nominations game will air in full. 10 celebrities remain in the Celebrity Big Brother house in the run up to the final: James Cosmo, Bianca Gascoigne, Calum Best, Speidi, Nicola McLean, Coleen Nolan, Jedward, Kim Woodburn, Jessica Cunningham and Jamie O’Hara. Who do you think will win this series? Vote in our poll HERE and let us know!